We love the winter. This is when Toys of Eros shines. We can really talk to you, and advise you with your shopping. Usually your alone in the store, and can ask all those embarrassing questions you don’t want to ask in front of 50 strangers. You can touch and turn on everything in the store, and we have time to explain everything. And everything in our store, (and most other stores,) are always on sale in the winter. 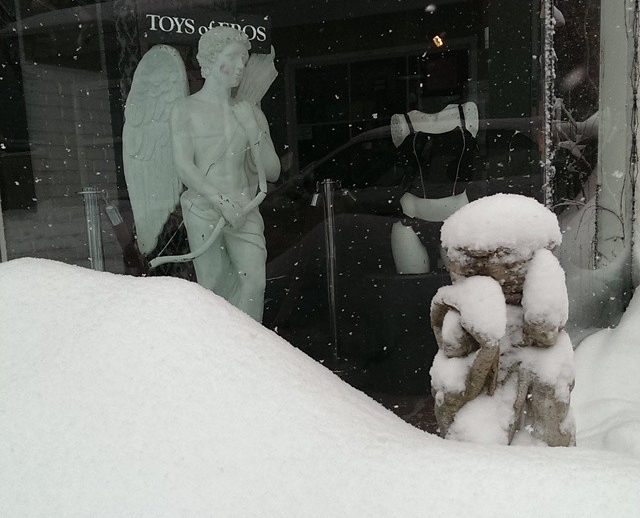 In the winter, you experience Provincetown as a local. It transforms into the fishing village and artist colony of 70 years ago. CAPE COLD : The Quiet Joys of Winter on Cape Cod, When the Hearths are as Warm as the Beach in July. Everyone who has someplace else to go has packed up and gone there, leaving the town running with just a skeleton crew. When you’re visiting in the winter, the locals remember you, and speak to you, because they know you’re one of them. You see what is good about the place even when it drizzles for a solid week. The man who poured your Irish whiskey Saturday night will wave to you on Sunday morning. Only a few stores might be open, but everything you find will be on sale, and if you ask the shopkeeper in the most offhand way whether she could possibly let you have it for less, she will very probably cut the price in half. I’ve made some of the most extraordinary buys of my life in Provincetown in winter, maybe because I am a more patient shopper when nobody else is around. The same apartments that in summer cost a small fortune, rent for peanuts in winter, and rooms at the best inns and guesthouses are available at flophouse prices. Most of the restaurants close. But the few diehards that stay open all year round have fabulous food, and a warm cozy environment. About half the shops and restaurants are closed in the winter, but what you lose is merely a whisper compared with all you gain. No one can shut down the Atlantic Ocean, or roll up the bay to keep it fresh for the tourists. In winter, the things that the teeming masses flock to see in summer are yours alone. In Provincetown in winter, you watch the sun set over the wet black caps of diving seals, an activity one can only dream about in summer. Bundle up and walk through Beech forest and over the weird lunar landscape of the dunes, where the sand sweeps and piles, shapes and un-shapes and reshapes itself, since I will never see this particular vista again. And yes, it’s cold. Damn cold. But you bless the cold that has swept most tourists all the way down Route 6 and back across the Sagamore Bridge. The cold has allowed you to see the ocean as it is occasionally meant to be seen: alone.